This review is for UK residents – if you’re outside the UK, you may want to check out Dosh App. I came across this on my Facebook feed – as it was offering £2 bonus for joining with a code. It said that I could earn money to pay my mobile bill, which I thought was a unique angle to a Cashback App. I mean, so often, the odd £5 or so that you make from an App, can feel a little pointless. But to have a primary aim for the money you are saving, is a good idea. However, you don’t even HAVE to download the App either, you can also simply use their Web App as well. So, What Is Airtime Rewards & How Does It Work? You can download this App via the App store, Google Play – or simply use their Web App. You can also add your mobile number via their website here and they will text you a link to download the app. Once you’ve signed up, you just need to add a debit or credit card, (the details of which will be saved securely) that you’d like to use to earn cashback. Then, whenever you’re in selected stores and make a purchase, you can make cashback on your purchases by paying with the App. What percentage of cashback you make, will depend on the store or restaurant you’re in, (I will give you some examples in a moment). This cashback is then saved up and you can redeem the money you make, against the cost of your mobile bill. 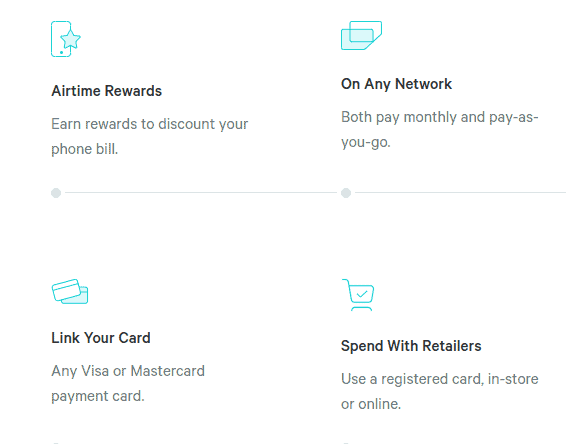 Airtime Rewards are with all the major mobile networks and it doesn’t even matter whether you’re on contract, or pay-as-you-go. I found the App itself to be pretty slick. Everything was simple and straightforward to understand, the App was clean and easy to navigate and there wasn’t too much going on! But Where Can You Use The App? There is not much point using the App, if there aren’t enough stores that you can use it in, right? The App is able to locate where you are and show which stores are within the closest distance to you. 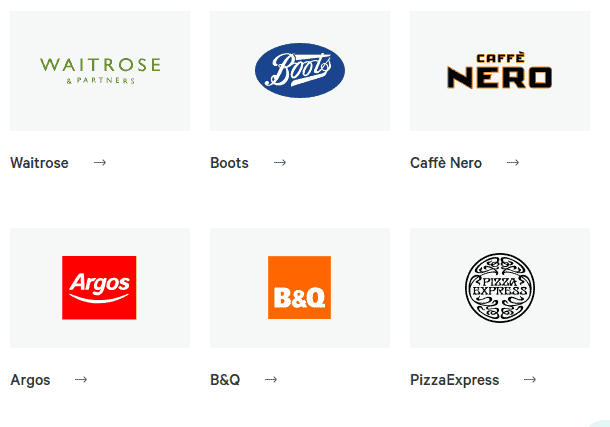 It goes without saying that, you’re going to be able to use this App more frequently in a big city, as they’re partnered with big brands that you’d see on the high street. However, I was pleased to see that even a local car park to me was included… Only 2% cashback, but it’s something. Although, would have been even better to see on of the major supermarkets, like Tesco, or Asda. There is a good selection, but how much cashback you would make – really depends on how often you shop in these types of shops, or eat in the restaurants they’re linked with. From what I saw, cashback ranged from 1%-5%. So, if you ate at Bella Italia, (for example) and spent £100, you would save £5, as their cashback amount is 5%. My mobile bill is only £10 a month at the moment, so I can see that making that £10 each month is realistic for me. I don’t eat out that often, but I will often visit the chain restaurants that they have available, a couple of times a month. I tend to visit shops like Boots on a weekly basis & Waitrose a couple of times per month. I’m thinking of upgrading my phone soon and one thing that held me back, was how much more it may cost a month…. But knowing I could budget towards that with this App, has made me reconsider. So far, they have some really good feedback coming in. At the time of writing, they have five stars on Trustpilot. They have four stars on Google Play, with over 500 ratings. They have 4.7 stars on the App store, with well over 5000 ratings this time! So, far they’re doing great with feedback and people seem to be enjoying the app and finding it easy to use. There has been the odd comment from people having issues with their phone provider actually taking the money off their phone bill. But airtime rewards have been responding to any comments and assuring that it will be resolved. Generally though, it’s gone smoothly. Plenty of different retailers available and hopefully more in future. You can link up with most major mobile providers. Earn 50p per friends and family sign up. How much you can use it will depend on your location – you’re going to get a lot more out of it if you shop regularly at the stores included and live in a large town, or City. Some people may prefer being able to choose to use their cashback as they wish, (rather than strictly their phone bill). While there is a fairly good selection of retailers, it would be better if they could add some more every-day shops – (maybe some of the big supermarkets!). Airtime Rewards have created a unique angle on cashback, in an otherwise crowded space! But specifically budgeting this towards an, (often significant) monthly bill? Is something different and I like that. For some people though, this unique feature could also be a downside – as some people would rather use the cashback towards something else of their own choosing. I can also relate to this, as much as I like the idea of earning money off a large mobile bill… I also like choosing where my cashback goes. For example; when I use cashback apps or websites – what drives me to continue, is the thought of exchanging the points for a gift card or cash. But perhaps when I upgrade my phone to a more expensive monthly charge, I will be more motivated to earn cashback to pay the bill!! 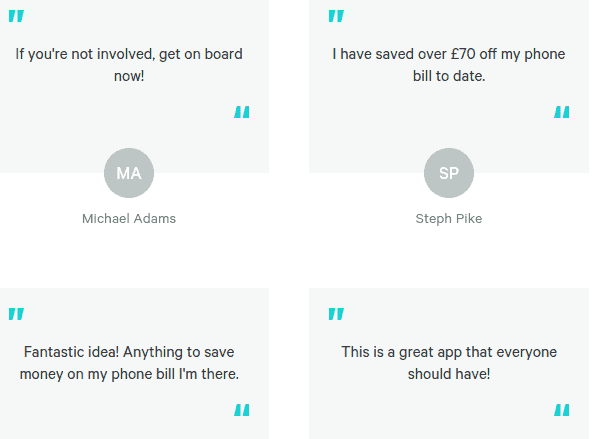 Airtime Rewards have got plenty of good feedback online so far and have plenty of happy customers. If all goes well, hopefully they will expand and you’ll be able to get cashback at even more shops and restaurants. I enjoy discovering new Apps that have the potential to either make or save money, but they can only go so far. Apps like this are great, because they don’t really require any effort on your part, (apart from remembering to use them and uploading a card!). But others that drain your time for minimal reward, (such as by downloading apps, or doing paid surveys) can be more time wasting. If you’re prepared to put in some work that will pay off down the line, there is potential to make hundreds and even thousands of pounds from your efforts. Check out this 40+ ways that you can start making money from your efforts online. I talk a lot about making “dollars,” but most of the things I mention are open to the UK too, (which is where I am from). If you’re interested in building an income online, but are unsure where to begin – I recommend that you start with the free training here. So, what do you think of Airtime Rewards?